SKECHERS USA, Inc., a global leader in lifestyle product and innovator of performance footwear, today announced that legendary Hall of Fame baseball manager Tommy Lasorda, Dancing with the Stars co-host Brooke Burke-Charvet, and fitness expert Denise Austin will host the fourth annual SKECHERS Pier to Pier Friendship Walk on Sunday, October 28. Each celebrity shares a long history with SKECHERS; Lasorda – a loyal friend of the Company for many years – will appear in a new SKECHERS ad campaign later this fall, and both Burke-Charvet and Austin have supported the Company’s footwear collections as celebrity endorsees. 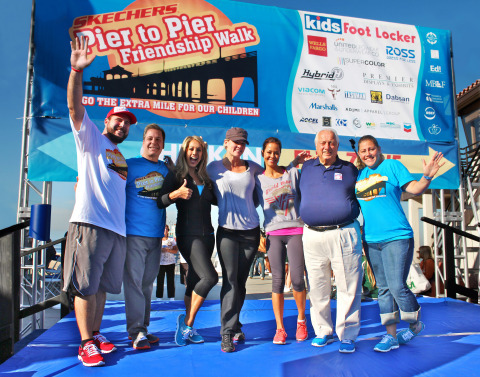 SKECHERS is anticipating 10,000 participants at this year’s Pier to Pier Friendship Walk, which is presented by Nickelodeon, and will aim to surpass the $600,000 fundraising total from 2011. Since its 2009 launch, the walk has raised $1.2 million to help retain vital educational programs, maintain smaller class sizes, upgrade school technology, as well as support The Friendship Circle – a non-profit organization that assists children with special needs and their families through one-on-one peer mentoring and social programming. Traveling from the Manhattan Beach Pier to Hermosa Beach Pier and back, the 3.4-mile walk will include performance from local school bands, cheerleading teams and free activities for the entire family. The Pier to Pier Walk will also be followed by the 22nd annual World Famous Pumpkin Races at the Manhattan Beach Pier. Individuals, families, team leaders and team members can register online at skechersfriendshipwalk.com or by mail for $25. Registration at the Manhattan Beach Pier on the morning of the event is $30. Registered participants will receive a commemorative SKECHERS Pier to Pier Friendship Walk t-shirt, goody bag and complimentary water and drinks along the walk route. For those who cannot participate, donations will also be accepted until the day of the walk; event sponsors and volunteers are also welcome to participate.